For processing carbide and thermal refining material, and ceramic. Cutting tools edge correction, grindstone dressing, and machine parts deburring., For processing carbide and thermal refining material, and ceramic. Cutting tools edge correction, grindstone dressing, and machine parts deburring. Purchased for grinding the blade of three-blade hand-held canna. When grinding the blade of Kanna, I tried to remove the three blades, polish the polished blade again to avoid the trouble of adjusting, with this file, polished it attached. 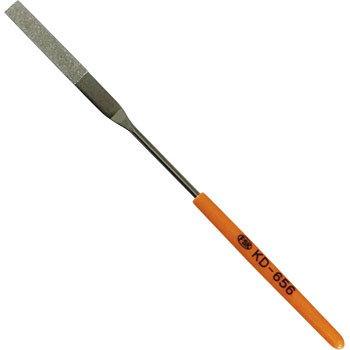 Because it is a fine file with diamonds, sharpness is revived simply by sharpening the tip of the blade lightly. It gets quite lively. This review is about item#38946957.